I created for you today Christmas Card using Stampin' Up! 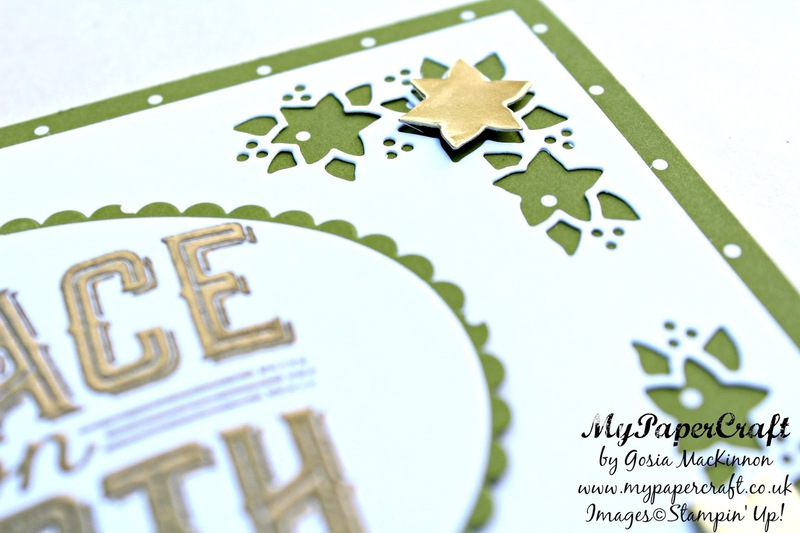 Carols of Christmas bundle and Merry Little Christmas DSP as well as a few more suppliers from Stampin' Up! Go to the bottom of the post to see the CHRISTMAS GIVEAWAY details. - CARD BASE - Whisper White Thick A4 Cardstock cut in half 5-7/8'' x 8-1/4'' (15 x 21cm) score and fold in half. - DSP LAYER - Merry Little Christmas DSP - 5-7/8'' x 4-1/8'' (15 x 10,5 cm). - TOP LAYER - Whisper White Cardstock - 5-1/2'' x 3-3/4'' (9,5 x 14 cm). Using piece of Gold Foil I cut 4 of the biggest corner flowers / stars to pop it up using Mini Stampin' Dimensionals. 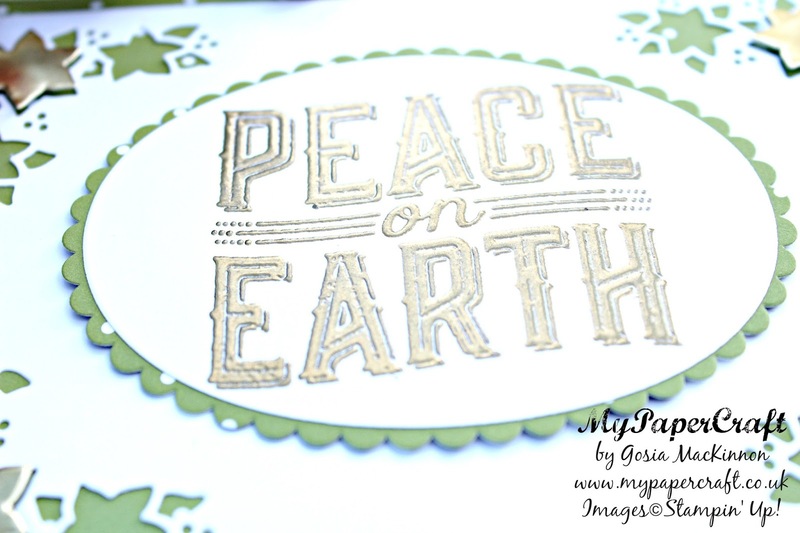 For the sentiment I use VersaMark as well as Gold Stampin' Emboss Powder. 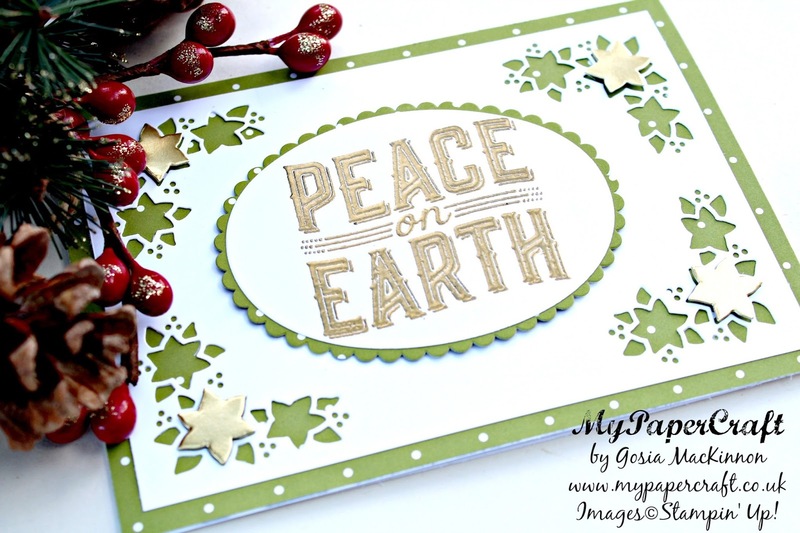 The scallop oval I cut out from middle of the Merry Little Christmas DSP layer to save the paper which is cover by Whisper White layer anyway. Leave me a comment bellow and I will draw a 1 winner to receive the Merry Little Christmas Designer Series Paper. The giveaway is international. I will announce the winners on my blog by 12th of December and you can find it under this post. I love your style of card making! Sweet card! I especially like how you make great use of all the materials. Thank you very much for your comment and congratulations, you won the Merry Little Christmas Designer Series Paper! Thank you so much RitaMaria. Thank you so much for your lovely comment. I have to say that I do not have much time to create more cards from the Christmas Card Pack but I will do more videos for the Memory Card Pack from the new Spring Catalogue and the Sale A Bration brochure as well as a couple from the Annual catalogue, I love the Memory Cards Pack a specially the price £9 / 12.25 Euro for 72 double-sided cards... bargain. Time to announce the lucky winner of the Merry Little Christmas Designer Series Paper Giveaway on my blog! Thank you to all for the lovely comments.